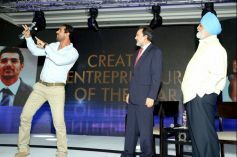 NDTV Profit's 7th edition of the Business Leadership Awards was held to honour the country’s crème de la crème of the corporate world, whose relentless pursuit of excellence has fuelled India’s journey to the forefront of the world’s economy, the glittering gala ceremony, held at the Hyatt Regency, New Delhi. 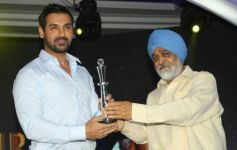 Actor turned producer John Abraham received the Creative Entrepreneur of the Year Award as the debutant producer for his achievement in the field of entertainment with the movie Vicky Donor. Talking about Bollywood's connection with black money and the underworld, John said, "I came in at a point of time when I did not experience any of these and I can go on record and say I don’t deal in black money. I haven’t dealt with it directly and I choose not to get into a situation where I have to deal with it." John further added, "The only thing I want to change about Bollywood is the name ..... I think we need to call it the Indian Film industry and for that we need to create content that is original and genuine, even if you want to rip off something please pay them for it. " The 7th edition of the awards brought together the best business minds and top bureaucrats of the country including Kumar Mangalam Birla, Anand Mahindra, N Chandrasekaran, Mallika Srinivasan among others.